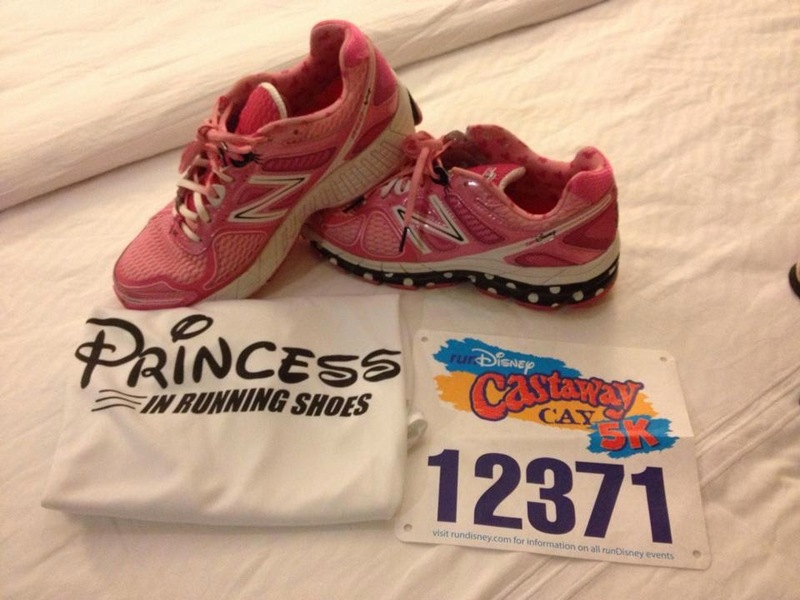 As many of you know, I used the excitement of a runDisney event to get myself off the couch and back into running shoes. 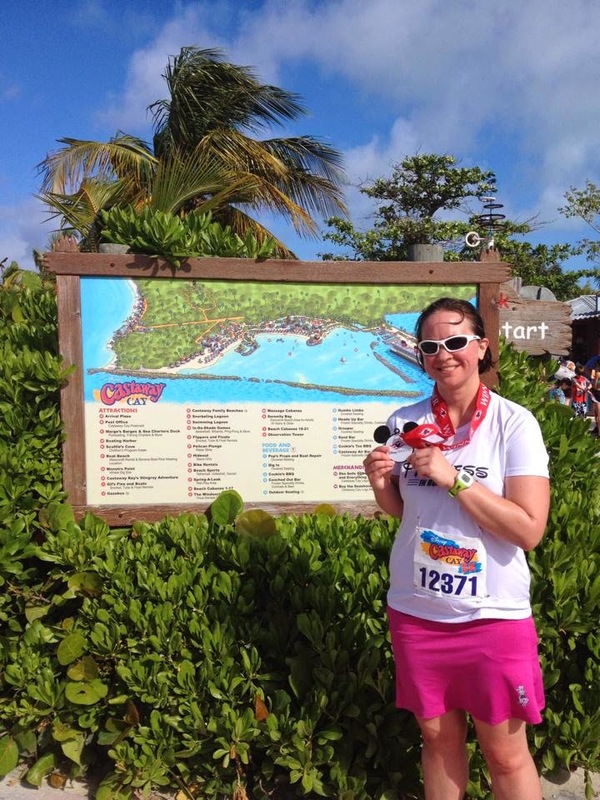 Even though the Castaway Cay 5K is not an official runDisney "race" it is an official runDisney "run" as evidenced by the bib and t-shirt :) Here is my recap of the race for both my running friends and those of you who also suffer from a mild (or major) Disney obsession! I read a lot of blogs about the race and the experiences of others before leaving for the cruise so I was well prepared on what to expect. The biggest piece of advice that I heard time and time again was that running this 5K rivals what it must be like to run on the face of the sun. The Bahamian heat and humidity is brutal and everyone recommended hydrating well before the run. I packed gatorades in our suitcase and used those and bottled water the day before the race to begin preparing. The other thing to know going into this run is that (as of right now at least) it is a free event. They do ask that runners pre-register at the Port Adventures desk and all runners are given a ticket and bib for race morning. The night before the run, I laid out my things so I'd be ready to go in the morning! We were supposed to meet at Evolution at 8:15 so I set my alarm for 7 and was at breakfast by 7:15. After a breakfast of oatmeal, yogurt, half a bagel and a gatorade, Dan and I made our way to Evolution. 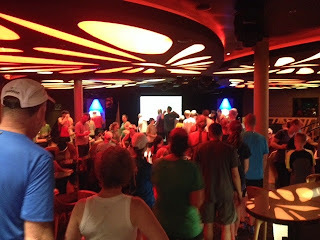 Even though Dan wasn't running, he was able to gather with the runners at check-in and disembark the ship with our group. 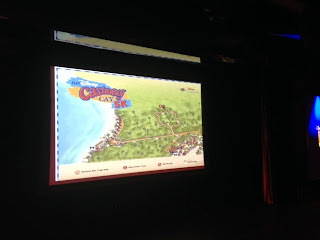 Once runners were all checked in, the cast member in charge went over a map of the route and gave instructions to parents who had little ones to drop off at Scuttle's Cove when we were on our way to the starting line. We got the all clear from the captain to disembark around 8:30 and our group quickly exited off the aft gangway (look at me being all nautical!) 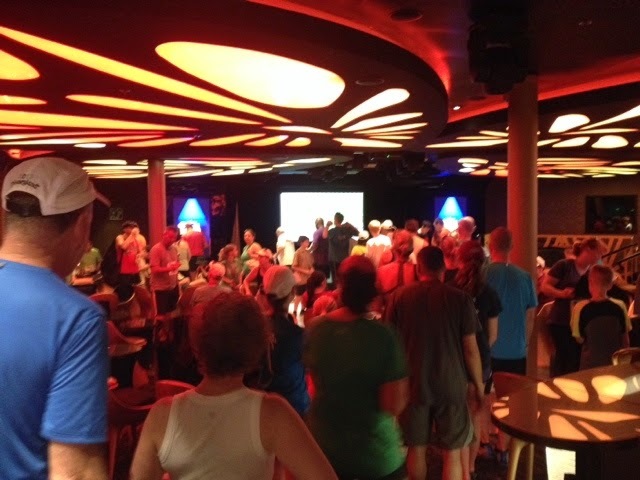 The starting line is about a 10 minute walk from the ship which provides a great warm-up! By 9:00 we were ready to begin. Jamesy (our fabulous British Disney cast member) reviewed the route map one more time and then away we went! The course is very flat and follows a bike route that is on the island. The bulk of the route is inside a bike loop that has tall shrubs on both sides. This helps provide a little shade for the run, but also makes it a little boring at times. However, you miss the shade of the bike loop when you turn onto the air landing strip that is miserable hot and sunny. 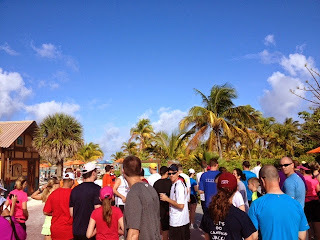 During the run, you pass a water station 4 times which is helpful during the run. You will find everyone from kids to grandparents, experienced runners to walkers on this course. . .and everyone is having fun! I felt surprisingly good during the run and was pleased with my pacing considering the heat, humidity, and the fact that it was my first 5K in about 8 years. When I crossed the finish line, my plastic bling was waiting for me! 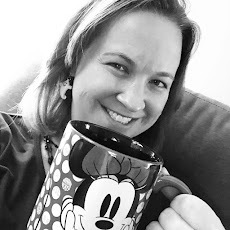 The Mickey medal is simply plastic that says Disney Cruise Line - not even a mention of the race - but I know what it was for and that's all that matters :) And in true Disney fashion, the race finishes next to a gift shop that sells Castaway Cay 5K t-shirts, which of course I had to buy. Over the next 3 hours I drank some gatorade and water to replenish. I felt good throughout the rest of the day. . .but then again, how can you not feel good in this paradise?? And the couples massage Dan and I had in a beach cabana after lunch probably helped a lot too! 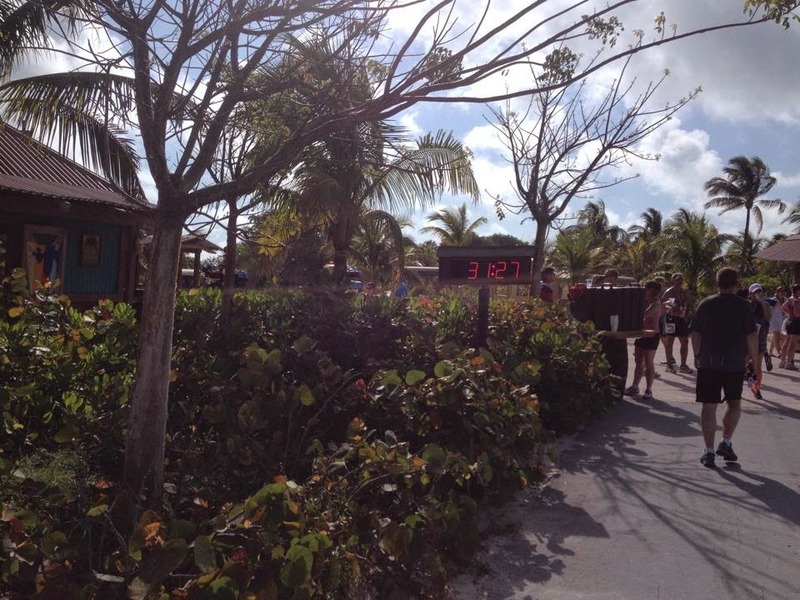 I absolutely LOVED my experience with the Castaway Cay 5K and would highly recommend it to anyone on their next Disney Cruise. On a personal note, this really motivated me to get back to running and I plan to now use this to propel me into some of the larger runDisney events in the years to come!